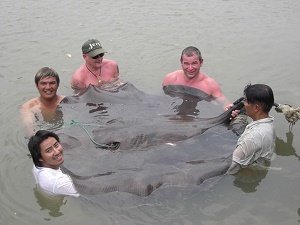 German anglers Uwe an Jojo went fishing at the Ban Pakong River in search of Giant freshwater stingray. Guided by Boy the anglers were to hook a large monster ray which would mark the beginning of a long protracted battle. Finally the prehistoric Giant freshwater stingray was landed.